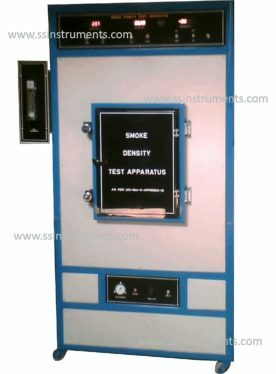 Smoke Density (as per UIC) - S.S. Instruments Pvt. Ltd.
Photo-metric System : To determine the Lux reading during the test period. The sample is burned under controlled pressure of LPG, through a specified burner as per the standard. A light source and a photo receptor is placed on either side of the chamber, and the percentage of light absorbed is displayed through a linear amplifier digital electronic photometer with 0 to 100% absorbance / Transmission / lux scale. The apparatus comes complete with timer , gas pressure gauge, damper and exhaust fan for removing smoke from the chamber. The instrument conforms to UIC 564 specification and also confirms various other international standards.